IN EARLY JUNE, Qatari designer Ahmed bin Mated Almaadheed published a stylised portrait of his country's ruler on social media. It was Almaadheed's response to the blockade on Qatar imposed by a Saudi Arabian-led alliance. The spare, monotone profile of Emir Tamim bin Hamad Al Thani, was an emphatic retort to the enforced closure of Qatar's land boarders and the foreign powers' aggressive list of other demands. Its message was clear: "I stand with the Emir." 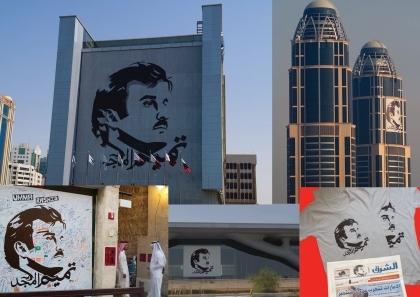 Within days, thousands in Qatar were using the image, and its Arabic script that reads "Glorious Tamim", on their Twitter and Facebook profiles. Taxi drivers started pinning photocopies of the image to their cars and then a telecommunications company adhered a giant visage to the side of its headquarters in Doha's Lego-on-steroids downtown. In the following days, corporate Qatar entered a frenzied competition to project bigger and bolder reproductions on every skyscraper. Today it adorns newspaper mastheads, tourist trinkets and badges pinned on thousands of lapels. Visiting Doha today, six weeks after the craze started, is to see a city wallpapered with this image - a distinctly Arabian icon that somehow blends Korda's Ché image with Omar Sherif and Uncle Joe. It is, perhaps, unsurprising, when a country faces an existential threat, that a bold, simple statement of solidarity should gain such traction. The way that this happened, however, might just presage more open, equal and free Qatar, some residents believe. Like many other countries of the Arab Gulf, Qatar is an absolute monarchy. Oil dollars make it, per capita, the world's richest country. However, the rights (or lack of them) endured by its 313,000 citizens, and much less by the country's 2.3m guest workers, are positively mediaeval. Citizenship can only be passed on by men. Guest workers who lose their jobs have to leave the country almost immediately. Employment rights are unheard of. Despite its similarities to Saudi Arabia, there are significant differences, however. Notable among these is the Al Jazeera broadcast network. Set up and funded by the Qatari Royal Family in 1996, the television station offers a middle-eastern vision of BBC-style programming. Discursive and with alternate views encouraged, it has pioneered real-time war-zone reporting that has on several occasions outpaced that of longer-established networks. It has faced criticism too - but what media platform hasn't? Its success is perhaps one reason why among the demands of the unwholesome alliance of Saudi, Bahrain, United Arab Emirates and Egypt against Qatar is that Al Jazeera be closed forthwith. Speak to professional guest workers in Doha and many, from the west and elsewhere in the middle east, believe that the country may be on the cusp of major change. "Come back in five years and you will find a very different country", said one. "Qatar won't be transformed overnight, the play between liberal and conservative forces will continue, but fundamentally, it is heading just one way", another told me. Several others expressed variations on this view. The stencil of the Emir is emblematic of this. It is a viral phenomenon, championed by the people, not stage-managed by the state. Optimists see it as a signal of the direction in which power is shifting. 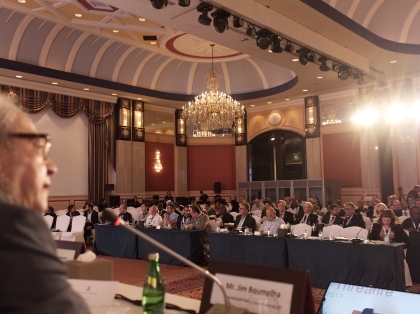 That was one of the reasons that the NUJ participated in a two-day conference in Doha - Freedom Of Speech, Facing Up To The Threat. 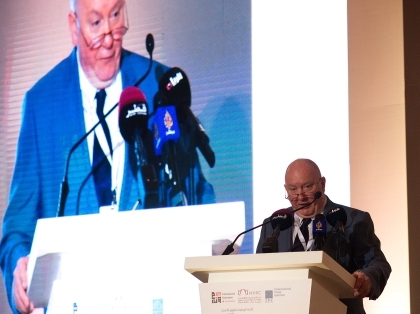 Organised by the International Federation of Journalists, the National Human Rights Committee (of Qatar) and the International Press Institute, it was a gathering of journalists, activists, academics and trades unionists from nearly 150 countries, as well as participants from Qatar. In all, nearly 500 people came together at Doha's Ritz Carlton on 23 and 24 July 2017. The real purpose of this event was to show those who would, on a whim, call for the closure of a broadcast network that the world is watching. Attacks on free expression will not go unchallenged. The decision to participate was not easy. The unsavoury aspects of Qatar's regime are well known, and for trades unionists in particular, travelling to a country where union membership and organisation effectively is outlawed is not undertaken lightly. The Qataris were not given an easy ride. Kenneth Roth of Human Right's watch provided a searing critique of life in the Emirate, as well as signposting a route to liberalisation. 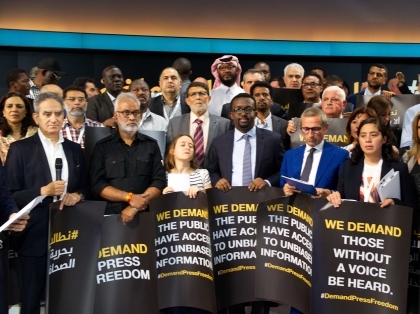 Younes M'Jahed, the IFJ's senior vice-president, called for trades union rights in Qatar and said that freedom of expression should be applied equally to poets, bloggers and civic society, as well as the media. I hope that I made a strong case that journalists' trades unions provide a unique and vital buttress to free expression. And the conference's concluding statement - unanimously adopted - left no doubt that reforming human rights in Qatar is vital if the country is to continue obtaining international support. We were joined by chapel representatives from Al Jazeera's London office (where the NUJ won recognition using the statutory process). Senior NUJ officials took the opportunity to meet Al Jazeera's management to press them to give staff their first pay rise in five years. And chapel representatives engaged with staff from the Doha newsroom in the hope that their presence might inspire thoughts of unionisation in the Arabian peninsular. As well as the conference itself, most participants paid a flying visit to Al Jazeera's studios to take part in a curious, live, in-studio, flash demonstration in support of free expression. Standing literally shoulder-to-shoulder with the channel's director general, with whom hours earlier I had conducted a combative negotiation, is a unique, if improbable, experience in my career as a trades unionist. Will our efforts make any difference? Prediction is the game of frauds and dreamers. If those who detected significance in the popular, scattergun application of the Emir's image are right, however, then perhaps the country does stand on a cusp. Having discovered that a television network partially inspired by its western counterparts could be a huge success, and establish the tiny kingdom in international consciousness, perhaps something similar will happen with human rights? Certainly if the provisions outlined in the conference's closing resolution were implemented, then a couple of high summer days dodging between faint-inducing desert heat and the hotel's Baltic air conditioning will have been more than worth while. Its an odd thought too that a graphic veneration of the monarchy might turn out to be a significant milestone on a reforming the Emir's absolute power. In common with many of those who make their living in this sandy, oil-rich enclave, however, I don't find the prospect entirely far fetched. Freedom of expression encompasses many things - art, protest, free association and free movement. 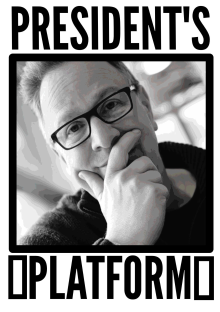 I plan today, however, to talk about the media in general, and professionally-produced media in particular. Media freedom is not necessarily more important than those others that I mention. Newspapers, magazines, websites and broadcast should, however, be exemplars of a discursive approach to forming opinions, free debate and the act of shining light on shabby, dishonest and selfish behaviour - as well as entertaining and enlightening. The free media faces some considerable threats at the moment, however. its economic model is suffering, the internet has taken away print and broadcast's previous monopoly on information. Social media had taken away its advertising. As a result, the number of journalists employed by traditional media houses is falling, lots of titles have closed, and resources for reporting are dwindling. governments threaten journalism, in a variety of ways, Trump undermines its legitimacy, the Saudis threaten its existence and a drip-drip of small measures make it harder to source and verify information. The process of reporting is physically hampered, journalists kidnaped, imprisoned and murdered. First things that all of us can do - international bodies, governments, media owners, journalists and the wider public. We need to build more popular concern about freedom of expression and that focus should be woven into everything we do. All who cherish free societies should make it their business to understand the international and national frameworks that underpin unfettered expression. Making this concern one of our first reflexes makes the defence of free speech and free expression something for which we all take responsibility. We should not be apologetic about using all the influence that we have - using the media itself as a tool - to promote free expression. We are fortunate that there is a broad supra-national framework that exercises global oversight - the UN Special Rapporteur on Freedom Of Expression - a post currently held by Professor David Kay - and the Organisation for Security and Co-operation in Europe's representative on Freedom Of The Media. It was good to see Harlem Désir appointed to the mandate last week, particularly as he already has a track record of thinking radically about the role of social media platforms on civic life. The formal organisations are buttressed by international representative organisations such at the International Federation of Journalists, one of our hosts here today, and any number of NGOs - Article 19, Reporters Sans Frontières and so on. There is also, clearly, a vital role for national governments and legislatures. Not only do they set the legal framework within which all media operates, they are also able to pressure other countries to act - for which reason I believe that extracting commitments to freedom of expression should be an important condition when negotiating trade relationships and granting foreign aid. The role on which I particularly want to concentrate, however, is that of individual journalists and their trades unions. All copy, every broadcast segment starts with an individual at their keyboard or with their microphone. It seems to me critical that all of those who do that kind of work are quick to ask "what are the implications for freedom of expression of any given act or occurrence"? We occupy influential roles and we should use that privilege for the greater good by keeping freedom of expression on the broader agenda. But sometimes that is difficult. Not all media employers are keen on this kind of agenda setting. Just think of Rupert Murdoch instructing his publishing house HarperCollins to scrap a book by Chis Pattern that was critical of the members of the Chinese leadership, who Murdoch was trying to court. Not all editors can be relied upon, either. In 1983, for example, when compelled by a court, the British newspaper the Guardian 's editor, Peter Preston, handed over leaked documents that led to the jailing of the whistleblower who supplied an important story. How much more powerful a statement it would have made if the editor himself had stuck to his principles, refused the court's instruction and gone to prison himself? So what it is that can provide individual journalists with the confidence to stand up for what, I believe, is the guiding principle of what they do. The answer is for them to have workplace organisations where they can openly exchange views and concerns and that allow them to take action in concert when the need arrives. In short, I mean trades unions. I can make a case for trades unions for any number of reasons -because we work to enhance wages, because we are a check against workplace bullying and erratic managerial decisions and because we lend workers a general air of self confidence. But I want to highlight a couple of instances where NUJ members in the UK have explicitly taken action to defend and enhance freedom of speech and to ensure that is it responsibly exercised. Express Group Newspapers is a British publisher, whose roots go back to the mighty Beaverbrook Empire, once owner of the largest circulation newspapers on earth. In recent times it has published the Sunday and Daily Express - mid-market papers, and the Daily Star - a popular tabloid. The politics of all three papers have generally been of the right or centre right. In the early 2000s, however, staff on the papers became concerned that the paper's coverage of asylum seekers had strayed from robust reporting to stirring up racism. One of its front covers, for example, led on the headline ASYLUM SEEKERS RUN FOR YOUR LIVES. The journalists came together and agreed about their concerns. A vote was taken and they agreed to send a collective complaint to the Press Complaints Commission - the UK's then press regulator. It did not stop the papers in their tracks, indeed, the journalists felt compelled to repeat this step a couple of years later, but it laid down a very public marker that the staff thought that the papers were being used in a way that went beyond what it is acceptable for newspapers to do. In 2006, the Daily Star 's management wanted to run a front page story badging the paper as The Daily Fatwah intended simply to mock Islam. The journalists walked out of their workplace and the newspaper changed its plans. My second example is even more dramatic. In 1985 the BBC commissioned a programme about life in Northern Ireland and how it had been shaped by the quarter of a century of armed conflict that had affected that area. While the programme was being made, then Prime Minister Margaret Thatcher declared that "terrorists should be starved of the oxygen of publicity". When it became know that the programme included an interview with a member of a paramilitary organisation, the then Home Secretary Leon Brittan stated that transmission would be against the national interest. The BBC governors held an emergency meeting and decided to obey this injection from the Government. Staff at the BBC and at other broadcasters were outraged. They met as members of the NUJ, and unions covering different skill groups and went on strike for a day in protest. In all 6000 broadcasters laid down their tools and a great many stood on picket lines. As a result the director general of the BBC, Alastair Milne, relented and the program was broadcast. Now, these are clearly the kind of extreme examples that occur very rarely. However, the fact that they did remains emblematic of an approach that encourages journalists to take collective responsibility for freedom of expression and freedom of the press. If journalists feel confident that, in extremis, they could take this kind of action, it gives them the confidence to challenge the myriad small challenges that might rein in free expression - the feelings of advertisers, or powerful individuals, the whims of editors or the dictates of owners. Trades union organisation is obviously only one of the necessary buttresses for freedom of expression, but it is arguably the most dependable. All trades unions do important, indeed, vital work, but those representing journalists are among the most important. I would encourage all journalists to join a union and to insist that they be allowed to organise in their workplaces. Doing that provides free expression's most important safeguards - the collective will of those whose profession requires they to exercise that liberty.